One morning on the Jubilee Line a woman leant over and removed a small amount of shaving foam I’d left on my ear. 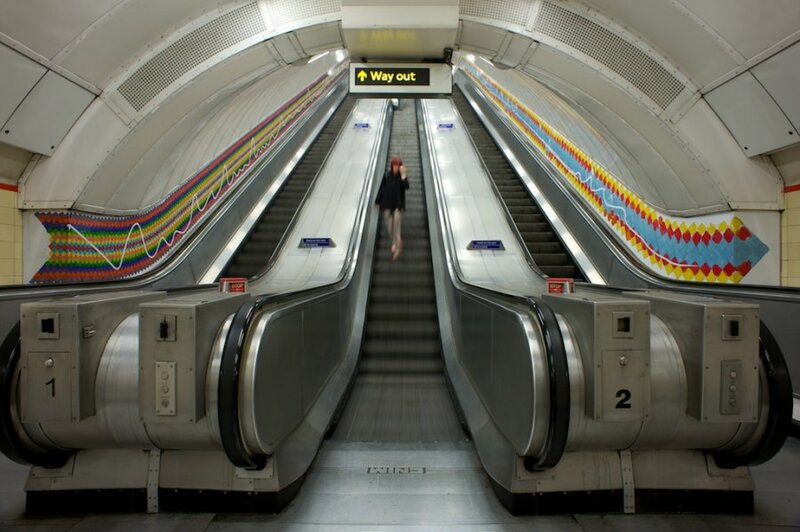 If London has a soul it’s located underground, shuttling along the Piccadilly or Victoria Line. I’ve been taking public transport a lot for the past week or so. My leg is munted, and I can’t cycle. At first I resisted the warning from the physio that I must not exert the leg. I would not go down into the seething pits of the London Underground. I could and would run with the road rats, like always. But on the second day of my resistance I was in such pain that once home, I grabbed at a bag of therapeutic frozen peas too aggressively, upending the bag and bestrewing the floor with peas. It was the wake-up call I needed, and I realised I had to stop cycling for a while. So here I am, on the tube. Already I look back with nostalgia on those days when my leg didn’t hurt, those days when I would burst through the revolving doors at work with my helmet and pannier, the rain lashing behind me. I miss the gasp of Jose, the security guard: “YOU CYCLED?” Once, I heard myself say these words: “Nothing stops me.” The innocence of those days. My tube journey starts at Brixton and finishes in Euston. It is a short but intense journey. I like how you can write or read on the tube; equally you can stare into space thinking nothing; none of these things are easy on a bike. Between stops, the carriage is usually pretty quiet. The quietness seems respectful. It provides the psychic distance that is necessary to compensate for your lost personal space. The quietness is also restful: on the tube, many people look incredibly tired. Some just close their eyes, going into their own private underground. 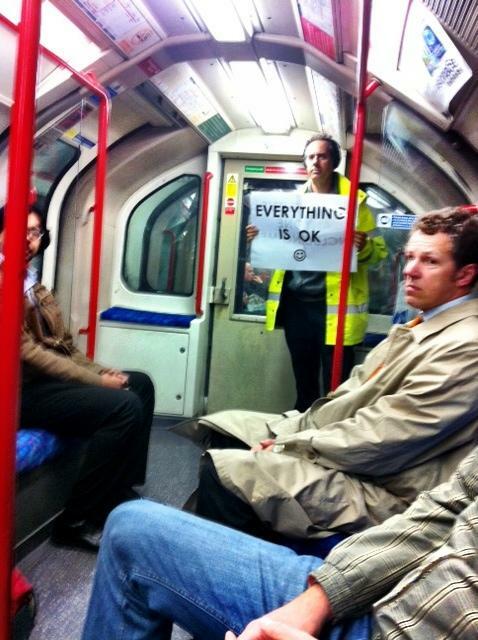 The tube has quite a formal atmosphere too. It’s like being part of a performance. The entry and exit opportunities are controlled. Each tube line is utterly unchangeable, like the script in an old, oft-quoted play, unlike bus routes upon which a bus can perform diversions and improvisations with ease. If there’s a delay on the tube line, if something has fallen on the tracks or if there is a signal failure, the train just has to halt, in the tunnel, and eventually you’ll hear the crackle of the controller’s voice, like a prompt in your ear. No one can abandon the vehicle in frustration, hefting shopping bags and the dog and the baby for the last few miles, like on the bus. You’re all there together until the end. I like that about the tube, and also hate it. I’d assumed from talking to Londoners that many of them must hate the tube, specifically the delays and weekend closures, the crowding, the mice fossicking around on the tracks, the Friday drunks. But of course millions of people depend on it, and out of this need has come a grudging love. The corporate logo has become iconic, as has the map, which has been embroidered, redesigned (unhelpfully) by Yayoi Kusama, and turned into wild animals. Both logo and map appear on mugs, underpants, and shower curtains. The artist Henry Hudson collected clumps of human hair from tube stations for one of his artworks, Crapula, a scavenged hairball head sculpture (as mentioned in this interview with Craig Taylor, who wrote/compiled Londoners). Most of all there is something primal about being surrounded by strangers, being alone together. 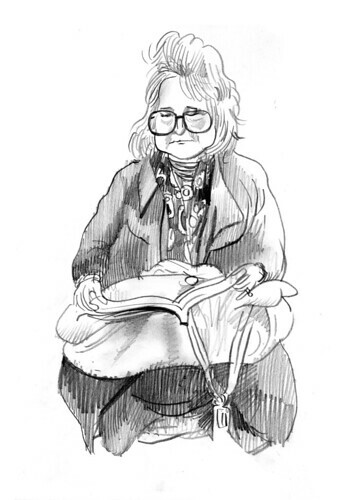 A year or so ago I came across the artist Elliot Elam’s drawings of people on public transport. One of the reasons I like his work is because I like people-watching, and these drawings recreate the diversion of it. But the thing is, tube etiquette demands that you don’t really look at other people. All you gain, usually, are brief impressions: a girl’s sparkly shoes, the surfeit of gel in a guy’s hair, the hairiness of a man’s hands. Most of Elliot’s drawings are scribbly and impressionistic as if all the details have been gathered in quick glances between stops, or later from memory; they are in keeping with tube etiquette. But the main reason I like these drawings is because, when the underground is heaving, you forget about the individuals. It’s all about survival. You become a closed door. In fact, when I come off the tube, I often feel like I’ve developed an allergy to humans. Elliot’s drawings are the antivenin – they pick out the faces and characters and stories again. There’s something comforting about that. I think the underground is about as romantic as London gets: rushing through the darkness under the city. You can usually only appreciate the romance in the abstract, not at rush hour when you’re wedged in someone’s armpit. Hopefully I’ll be back on my bike in the next couple of weeks. 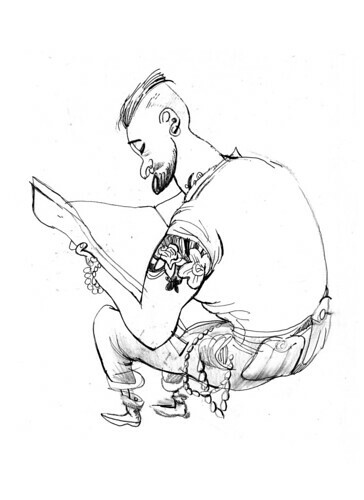 A friend of mine in Wellington (Andrew Shaw) draws people in the Wellington Public Library and in cafes around town. I remember there were a couple of great ones of old guys fallen asleep, heads thrown back and mouths open. There’s something that just really appeals to me about drawings of passersby/strangers.